Crushing Capacity will be depended on properties and sizes of raw materials. The above table shows approximate crushing capacities for limestone of normal hardness and bulk density of 1.6. The main frame is constructed of high quality steel providing a rigid and robust design. The frame has been designed utilising FEA to ensure that it is capable of performing the duty required. The main shaft is forged from high quality molybdenum steel (SCM4) which is capable of withstanding the severe impact loads expected. The shaft is supported on two heavy duty 23168 spherical roller bearings. The bearings are grease lubricated and protected by seals and labyrinths to ensure no dust contamination. The two cast iron flywheels ensure maximum inertia and the unit is a balanced assembly. The pitman also utilises heavy duty spherical bearings and is protected by an impact wear plate. Jaw and cheek plates are manganese-chrome steel of varying manganese contents to suit the application. The jaws are designed for high capacity and none choking. They can be either flat or deep or shallow grooved profiles. 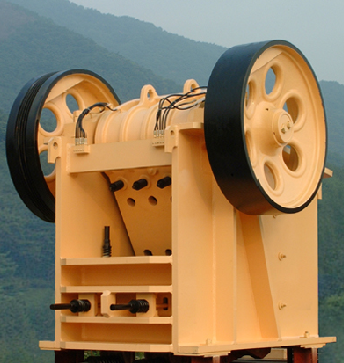 The squeeze action in the jaw crusher is achieved by converting the rotary action into a reciprocating action. The most effective and powerful method of transmitting this force is by way of the toggle. The toggle and seats are none lubricated due to the fact that only dry rolling contact occurs between the plate and the seats. The seats are also fitted with deflector seals to keep them free of debris. This system provides for easy maintenance and operation. The toggle seats are hard faced and the toggle plate is ultrasonically hardened to increase service life. The toggle also acts as the overload protection in case of uncrushable material or packing of the crusher to prevent damage occurring to the other major components. 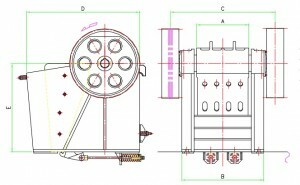 Adjustment of the setting is made by means of a hand operated hydraulic ram and appropriate shims fix the required setting.